The flow picture has further deteriorated over the two weeks ended November 14, with total outflows amounting to more than $16 billion. 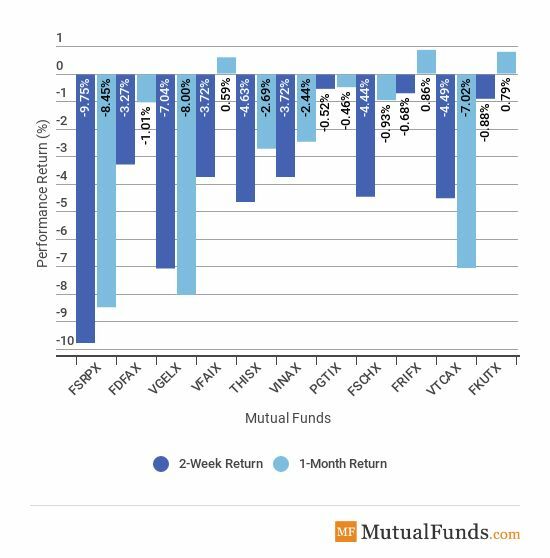 Equity mutual funds experienced less carnage than bond and hybrid funds. Indeed, flows to equities were positive for the week ended November 7 at $1.8 billion but turned negative next week at $3.8 billion. Meanwhile, the bond funds saw total outflows of a little more than $9 billion during the period, while hybrid funds, a combination of equity and bond holdings, suffered more than $5 billion in withdrawals. Brexit has been on the mind of many investors these past weeks. The European Union reached an accord with the U.K., putting aside the issue of Gibraltar. The ball is now in the court of U.K. Parliament, which should vote on the deal. It is believed there is no parliamentary majority for the deal to go through, but Prime Minister Theresa May started to appeal directly to voters in an attempt to convince them this is the best deal U.K. can achieve. Meanwhile, U.S. President Donald Trump weighed in on the debate, saying the U.K. would not be able to do trade deals with the U.S. and calling the accord “great” for the EU. Germany’s economy contracted in the third quarter by 0.2%, triggering worries about the health of GDP growth at a time when the country is facing political heat given the dwindling support for long-time Chancellor Angela Merkel. The European Central Bank signaled it was ready to keep its loose monetary policy unchanged if the prospect of higher inflation dissipates. Crude oil inventories have continued to rise over the past two weeks, setting off a wave of selling in the market. There are particular concerns about demand given the weak economy in Europe, and the negative effect of the Sino-U.S. trade war. Technology stocks (NASDX) were the worst performers these past two weeks, dipping nearly 7%. The Thanksgiving holiday and Black Friday sales did not help the market sentiment. Indeed, the Nasdaq 100 is also the worst performer for the rolling month, down 7.24%. The bond market acted as a safe haven, with (VBMFX) advancing 0.39% in the past two weeks. For the rolling month, international bonds posted the strongest performance, with (VTIBX) edging up 0.46%. T.Rowe’s technology index (PGTIX), which has Asia-based Tencent Holdings and Samsung Electronics among its top holdings, reported the smallest loss for the two-week period, down 0.52%. The index’s heavy exposure to the Asian technology market helped as Chinese stocks were relatively shielded from the global market rout. The worst performer is the retail sector (FSRPX), which shed as much as 9.75% of its value, despite reportedly good sales numbers for Black Friday. Online retailers were favored to the shopping malls. The retail fund, which includes names such as Home Depot, Dollar General and Amazon, was also the worst performer for the rolling month, down 8.45%. The real estate sector, Fidelity Real Estate Income Fund (FRIFX), was the best performer for the rolling month, rising by 0.86%. The European stock markets fell across the board, as fears have grown that a slowing economy will dent the region’s profits. 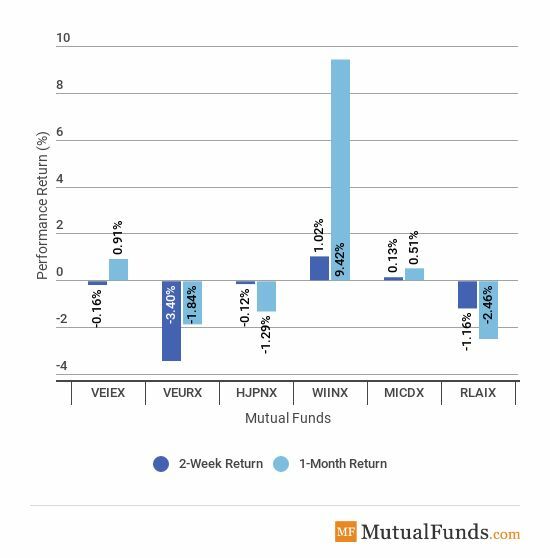 Vanguard European Stock Index Fund Investor Shares (VEURX) declined as much as 3.4%. Meanwhile, India (WIINX) was again the best performer for the past two weeks, edging up 1.02%. Combined with the prior two weeks’ impressive performance, India is also the best performer for the rolling month, up 9.42%. Latin American Equities (RLAIX) posted the poorest performance over the 30-day period ended November 23, down 2.46%. 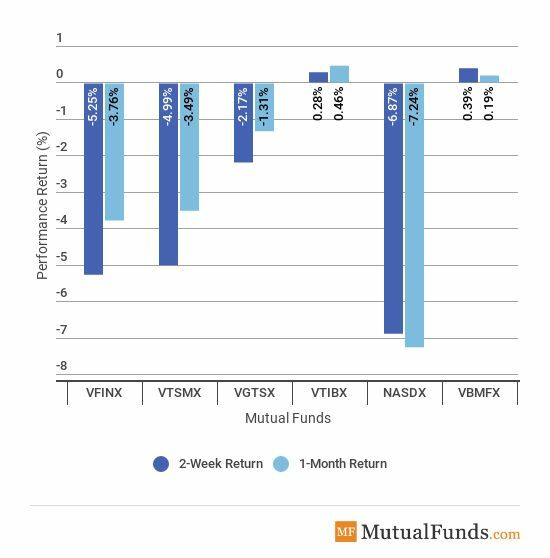 The broad equity market was hit the most during the past two weeks, with (VFINX) tumbling as much as 5.25%. At the same time, John Hancock’s Multi-Currency Fund (JCUAX), was the best performer with a gain of 0.79%. 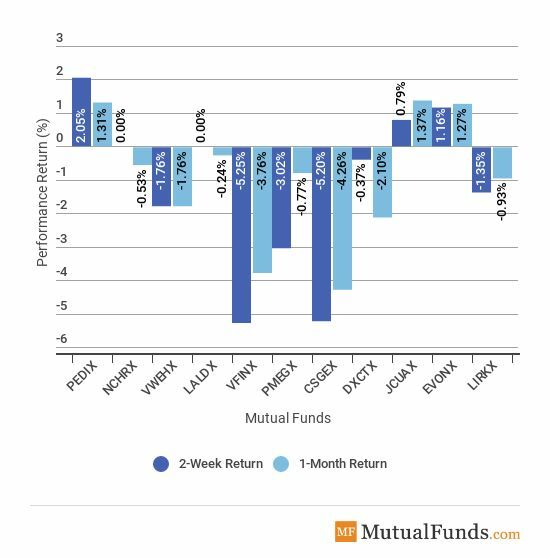 John Hancock Funds Absolute Return Currency is also the best performer for the rolling month, up 1.37%. BlackRock’s Small-Cap Fund (CSGEX) is the biggest loser for the past month, down 4.26%. The flow picture continued to worsen across the board, although equities suffered a less severe blow than hybrid and bond funds. The broad stock market was hit this week, with the retail sector the worst loser despite strong online sales. European stock markets dropped on fears of a slowing economy, while John Hancock’s multi-currency fund was among the few gainers.